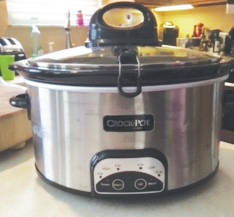 Coming home on a cold evening to inviting smells of food from your slow cooker or “crock pot” makes us all feel so good. Slow cookers help less expensive, leaner cuts of meat become tender and shrink less, helping you have economical, healthy meals. With food cooking at lower temperatures, though, it is important to follow some food safety tips to ensure your food is safe to eat. • Always start with clean hands and clean equipment and utensils. • Always thaw meat or poultry before putting it in the slow cooker. Since the slow cooker uses lower temperatures to heat the meat or poultry, it could be in the temperature danger zone too long if frozen when put in the cooker. • Keep perishable foods refrigerated until you are ready to put them in the slow cooker. • Fill the slow cooker with vegetables on the bottom as they take the longest to cook. Then, add meat or poultry and liquid to the slow cooker. It is best to cut the meat into smaller pieces. • Heat any liquids you add as this will help ensure the food is not in the temperature danger zone as long. Liquid is necessary to create steam. To ensure effective heating throughout the slow cooker, the liquid level should cover the ingredients, especially when cooking meat or poultry. Follow your manufacturer’s directions and recipes as to how much liquid should be in the slow cooker. It is typically recommended the slow cooker be half to two-thirds full. • If possible, turn the slow cooker on High for an hour to help reduce time in the temperature danger zone. • Keep the lid on the slow cooker during cooking. Raising the lid drops the temperature in the slow-cooker by 10 to 15 degrees and slows the cooking process by up to 30 minutes. • Store leftovers in 2-inch high containers and refrigerate within two hours. It is not recommended to reheat leftovers in the slow cooker. Instead, use the stove or microwave to ensure the temperature reaches 165°F. If the power goes out when you are not home and you are using the slow cooker, throw away the food even if it looks done. If you are home and can immediately cook the food in a different way such as a gas stove, you can finish cooking. Reviewed by Jenny Lobb, Family and Consumer Sciences Educator, Ohio State University Extension, Franklin County.